Self care is the key to living a healthy and happy life, but the most common reason why we often ignore self care routine is the lack of time. Of course, today, we all are too occupied and it’s hard to get free time to be you. And, if you are a mom and working at the same time, then the workload gets magnified and you literally struggle to find out the “me” time. If that’s you, then here’s the post worth checking as today I am happy to share 11 essential self care tips for busy moms. If you are a working mom and you have no time to look after yourself, then you must check this post and learn how to take care of yourself, even when you hardly find time to look after yourself. I completely understand that the life as a busy mom is not so easy. But that should never be the excuse to ignore your own self. This is because you are the soul of the family and if you fall sick, it will create a huge impact on not just your life but on the whole family. Therefore, you need to be a super mom who knows how to balance her professional and personal life without compromising with her self-care routine. Self-care is important for all of us, but it’s even more important for a mom because you work double hard for your children and the other family members as well as to earn a living. So, sometimes, you just need to give yourself that little time to just sit, relax, pamper yourself and get recharged for the hard work. I know it is not so easy to implement as it is easy to tell, but if you are determined, nothing can stop you. Moreover, I will help you with some essential and easy to apply self-care tips that will suit you. Earlier, the work was stereotypically divided among men and women. While men took care of the financial department, it is the women who looked after the children and managed all of the household chores. But, now the time has changed and both men and women are considered to be equal. Women today are the equal bread earners of the family. However, even today, in many places the household chores are considered to be the responsibility of only the women. Many a times, the moms are unable to cope up with the pressure and they sacrifice their career for family but do you think this is a solution? Well, certainly not, you got to continue your career to remain financially independent, give enough time to your children as well as find out time for some self-care. Now, it certainly sounds really difficult but trust me, if you are determined and follow a disciplined life, you will be able to do it. And, as far as your household responsibilities and taking care of your children is concerned, share your responsibilities with your husband. Tell him to do that while you are resting or taking care of yourself. Children or other household works are not just the responsibility of a mother alone but the father also has got equal responsibilities. So once you both learn to share the responsibilities, you will be able to find out more time for yourself. I am sure if your husband or other family members love you, they will happily share the load with you. All of us need to love ourselves first because if we do not love ourselves, many a times we will be taken for granted and this is especially true for the busy moms. 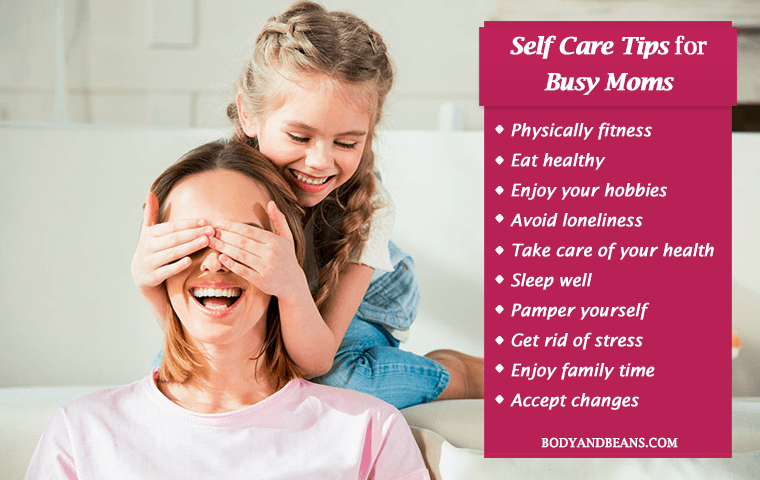 So, please take note of the below mentioned self-care tips for busy moms and try to implement them in your own life to make it better and happier for you. Self-care never means to ignore the other responsibilities. It just means to take care of yourself while performing your other duties side by side. It is just that, you must give yourself the chilling out time which is very much needed to recharge your batteries otherwise you will be become too exhausted physically and mentally. So if you are a busy mom and you’re wondering about how to take care of yourself with limited time, follow these self care tips for busy moms to get started and make it right. First of all, you need to keep yourself physically fit. This is because if you fall sick, it is going to be bad for all of the family members especially for your children who need utmost care from their mother. Now, simply running here and there and doing the household works or travelling to office won’t be enough. Also, most middle-aged women are prone to gaining a lot of weight especially after giving birth to a baby. So, you need to do regular exercises to stay physically fit and healthy. To stay physically fit, it is always not necessary to push yourself too much and do rigorous gym workout. In fact, too much strenuous exercises can make you sick or hurt you if you are not doing it properly. So, what you can do is to either take expert’s help or do basic stretching and yoga. This will keep you fit and active. Also, try to find time to go out for daily morning or evening walks or jogging. This will also help you to stay in shape. It is even better if you can do a bit of running. One of the other essential self-care tips for busy moms that I find worthy is to be to eat healthy. This is really important because many times, busy moms are so involved in taking care of their child, that they ignore their own meals. Now, this is absolutely not done. Your body needs healthy foods to stay strong and so, you need to eat healthy. To remain healthy, your diet should be balanced. It should involve all of the important nutrients necessary for your system. 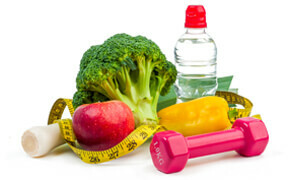 Maybe you can consult a good doctor or a dietician and get a good diet plan as per your body’s requirements. However, not just balanced and healthy foods, you also need to maintain proper meal timings. It is best if you can eat 5 small meals a day. This will keep you fit, healthy and strong. I know you are busy and you got a lot of work to do but that does not mean you will ignore the things that you love to do. Well, when your little one is sleeping or has gone to sleep, try to get involved in things that you love to do. Be it singing, dancing, painting or anything else doing things that you love is something that will surely give you a lot of happiness. And, trust me, if you are happy, no work or responsibility will seem like a burden for you. Interacting with close friends, neighbors and other relatives keeps an individual happy. So, if you are too busy in the weekdays, at least try to find out time and catch up with your friends, neighbors etc. in the weekends. Go out with them or arrange for parties and do get involved in some fun activities. Such small refreshing break from your daily mundane lifestyle is very much needed and you also must do it to keep yourself happy and motivated. Otherwise, the same old routine life will drive you crazy and will make you depressed in the course of time. Many busy moms also ignore their health. But trust me; there is no bravery in it. Well, if you fall sick, your children will suffer a lot, so taking care of your own health should be your priority. In fact, not just for your children, maintaining your health is in general very much required to lead a happy life, so please do not ignore it. Make it a point to go for timely checkups. If needed, do tests, take vaccines etc. and keep yourself free from the diseases. Lack of proper sleep may lead to mental and physical problems and studies are a proof of that. From badly affecting your mood and making you depressed to causing unnecessary weight gain, increasing the risk of having cardiovascular diseases, being sleep deprived can cause a lot of health concerns. And, busy moms are at high risk all the time. This is because most of the time, they are so involved in taking care of their child throughout the night that they fall short of sleep. This is really bad and harmful for you. So, get at least 7-8 hours of sleep. If your little one is small and wakes up all night, then what you can do is to share the work with your husband. You take care of your child half the night and let your husband do it the other half. Also, get some sleep in the daytime whenever you get some free time to make up for it. However, if you have difficulty falling asleep and stay too much stressed up even during the night then you should learn these hacks to fall asleep fast and easily. One of the essential self-care tips for busy moms is to pamper yourself. Go for facials and hair spas monthly and also take up the other natural remedies to maintain your skin and hair. Do makeup when you are going out. If shopping gives your happiness, then pamper yourself with beautiful dresses and other gifts. Trust me, if you look good, it will automatically boost up your confidence and you will feel happy and jovial even while you are in a pool full of responsibilities. Stress is a silent killer and it may take a huge toll on an individual’s health. And, you being a busy working mom, is sure to undergo a lot of stress in life. But, you need to tackle that. Find your own happiness out of all the challenges that life throws at you. To keep your stress under check, you can actually try out meditation and other relaxation techniques. Do things that give you pleasure and happiness. I am sure if you try a little hard, you will be able to get rid of your stress much efficiently. I personally believe that a family should be a source of joy for any individual and for a mom, it is all the more applicable. A mother is one selfless being who can do anything for her children and other family members but when you make the family a source of your happiness, then even the little sacrifices you make for your loved ones will actually make you happy. In other words, when you see a smile in the face of your loved ones, it will automatically bring a smile in your face and you will forget about all your hardships and challenges. Trust me, keeping your loved ones happy and deriving joy from seeing them happy is one of the best self-care tips for busy moms. Who does not face problem in life but if you sit down with that and keep getting depressed, things are not going to change for the better. Therefore, you must strive out to change the situation for the better and keep a positive attitude all the time. I personally believe that individuals who are mentally strong are the happiest because they are ever ready for challenges. And once you learn to remain positive, life around you will automatically seem to change for good. Try to forget about things that you have not got in live instead focus on things that you have. Always remember that there are others who are even in a bad state than you or have not even got half the happiness in life that you have received. So, please remain happy and satisfied with what life has given you. These words may sound motivating but while implementing things are always not easy. I understand that staying positive and controlling emotions is difficult in difficult situations but trust me, with time, you will definitely turn stronger and will learn to stay positive even in tough times. You just have to give it a try. Life for many women undergoes a big change after marriage and all the more after having kids. Your priorities change in life. But, if you keep running away from your responsibilities or want to go back to those carefree days, then things may turn bad for you. You must accept the fact that life has changed after having kids and that it is absolutely OK. The better you are able to accept the things that life throws at you, the better you will be able to stay happy, calm and focused. Life of a busy mom is not always a bed of roses. She faces a lot of challenges and even does a lot of sacrifices for her kids and other loved ones. But what about caring for yourself? Even if you have a lot of responsibilities, you must never get lost in them so much that you start ignoring yourself. So you must try to balance the professional and personal life and at the same time get involved in self-care. Not getting time can’t be an excuse, you have to find time and look after yourself. I have already shared a few of the best and essential self-care tips for busy moms, and I seriously hope that you will try these and take care of yourself. It is not that there are no other self-care methods but these are the easiest ones that can be followed by every busy and working moms. Trust me, when you start taking care of yourself, it will keep you happy and confident. You will be able to perform all your responsibilities with a smile in your face. Nothing will seem like a burden. You will derive immense joy from whatever you are doing and working on. Self-care is seriously important. Don’t you think so? If you are a busy and working mom, then I would like to know about how do you take care of yourself. What are your favorite self care rituals that you never miss? Feel free to share your thoughts and hacks by commenting below.